Virginia Tech was 100-69 during Williams' five-year tenure and went to four postseason tournaments, including a program-record three consecutive NCAA Tournaments, with this year's run ending in the Sweet 16. 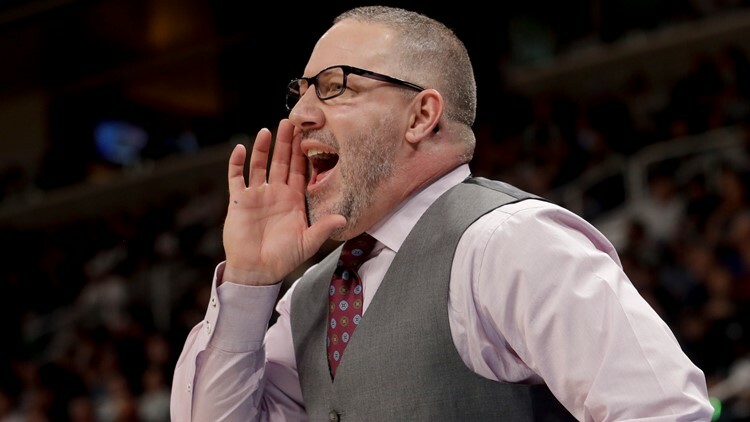 COLLEGE STATION, Texas — Texas A&M hired Virginia Tech coach Buzz Williams on Wednesday, luring him back to his home state to try to turn the Aggies into a basketball power. "The Buzz is Back," Texas A&M tweeted from its official team account. At Texas A&M, he takes over a program struggling to consistently compete at the top of the SEC. "We kept our focus on finding an elite basketball coach, a developer of talent, a tremendous recruiter, a tireless worker and someone who fits Texas A&M. Buzz Williams is all that and more," Texas A&M athletic director Scott Woodward said. "I have no doubt that Buzz will take our basketball program further than ever before and will make Aggies everywhere proud." The school fired coach Billy Kennedy after the Aggies finished 14-18 and 11th in the SEC this season. The Aggies reached the NCAA Tournament in just two seasons under Kennedy, reaching the Sweet 16 in 2016 and last season. His best regular season was in 2015-16 when the Aggies went 28-9, one of three seasons where he won more than 20 games at Texas A&M. Williams was a Texas A&M assistant and recruiting coordinator under coach Billy Gillispie from 2004-2006. That staff took the Aggies to their first NCAA Tournament appearance in 25 years in 2006. At Virginia Tech, Williams took over a program that had finished last in the ACC for four straight seasons. Before his first season, the Hokies lost five players who transferred, then a sixth during the season when he was suspended indefinitely by Williams. What followed was steady improvement: This season, the Hokies set a program record with 26 victories after Williams suspended his most athletic player, Chris Clarke, before the season. Williams' return to College Station puts him close to Dallas and Houston, which regularly produce top recruits, and he joins an athletic department Woodward is pushing for championships. In 2017, the school hired national championship-winning football coach Jimbo Fisher from Florida State and gave him a 10-year, $75 million contract. Terms of Williams' deal with A&M were not immediately released. "I am so humbled and honored to return home to Texas A&M, and proud to lead the Aggies," Williams said. "This is our home, and we are ready to join with the 12th Man to win championships, graduate our players and represent this world-class university with integrity."